The Boatswain’s Mates of USS Nimitz (CVN 68) are making history, as they become the first team of Sailors to remove the anchor and chain of an aircraft carrier rather than contracting the work out to civilians. Fifty-seven links, each weighing 350-pounds, make up just one 90-foot shot of chain that weighs a total of 20,500 pounds. Twelve shots of chain collectively hold a 60,000-pound anchor. Considering the average person weighs less than 200 pounds, it’s safe to say the task of removing Nimitz’ anchors and chain is no small feat. 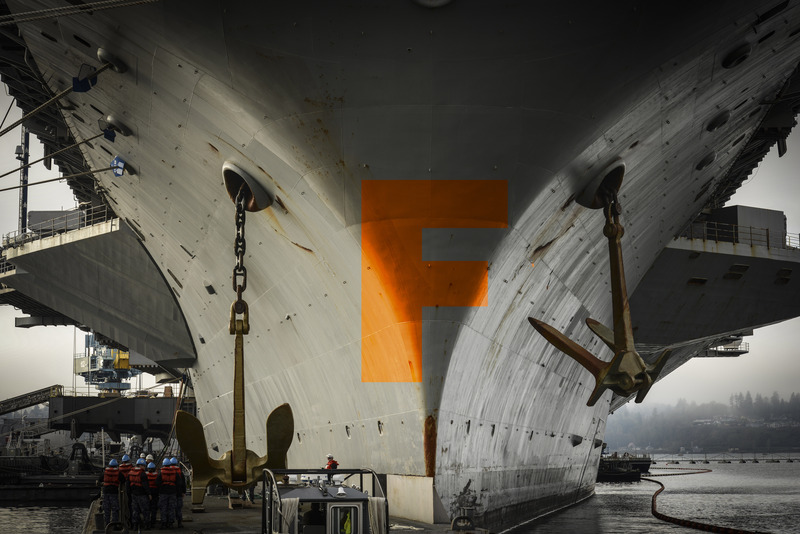 The Deck Department had the daunting task of removing the 60,000-pound anchors from both starboard and port sides of the ship in order to perform preventitive maintenance and ensure the ship is ready to return to the fleet sometime next year. “We pay out the anchors down onto a barge that has two tug boats attached to either side to ensure it is in the right spot,” said Brill. The anchor has to lay a certain direction so that there is no risk of it falling over. Sailors new to Deck’s Sea and Anchor Detail receive training almost every week in order to ensure that they know the proper procedures to raise and lower the anchor safely. This maintenance allows them to learn even more. This process is not only helping Nimitz be prepared to answer the nation’s call of duty, but is also benefiting junior Sailors currently serving on Nimitz and will continue the cycle of training. The excitement the Boatswain’s Mate’s have about removing the anchor and chain is being reflected by their work ethic as they continue to fix for the fight.